Customs and Border Protection began the new year with a computer outage that caused long lines at several airports. The agency said in a statement that it “experienced a temporary outage with its processing systems at various airports" that began at around 7:30 p.m. Monday and lasted until 9:30 p.m.
"During the technology disruption, CBP had access to national security-related databases and all travelers were screened according to security standards. At this time, there is no indication the service disruption was malicious in nature,” Customs and Border Protection spokesperson Jennifer Gabris said in the statement. During the outage, the standard CBP technology was unable to recognize who was a U.S. citizen, a resident and who was just a visitor, according to the agency. "One wasn't taking the picture. One wasn't printing the receipt. It was just — one was speaking German and that's it. It was crazy," one traveler in Dallas told NBC News about the self-service technology. People posted photos of long lines at John F. Kennedy International Airport in New York City and Hartsfield–Jackson Atlanta International Airport in Georgia. Several other airports said they were affected. Some travelers abandoned the self-service technology and instead were processed by border agents. In the end, agents were able to process all incoming international travelers using alternative procedures during the outage period. 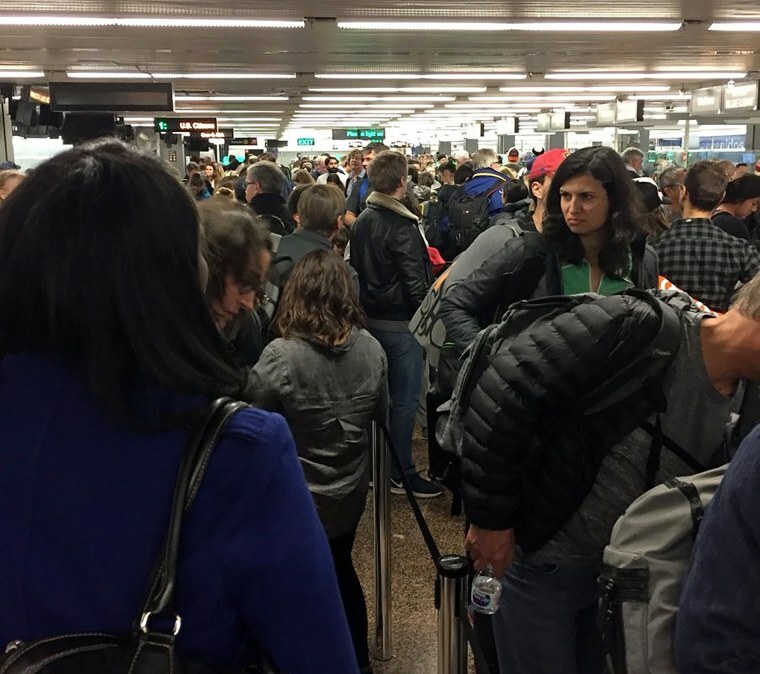 It is still not known what caused the outage, but as of Monday evening and Tuesday morning, CBP said all stations had resumed normal service nationwide. Atlanta's airport suffered a power outage a week before Christmas that pulled the plug on thousands of flights. That power outage was caused by a fire that broke out beneath the airport, officials said.